Thanks to Jennifer Redd, eCampus hosted a Digital Pedagogy Workshop on April 9 for ~25 engaged faculty from a variety of departments and disciplines all over San Jose State University. Because the attendees were guaranteed to hail from a variety ofDigital Pedagogy expertise levels, I ran the workshop with multiple points of intervention and input captured with Session Notes in Google Docs. The primary purpose of the workshop focused on theorizing Digital Pedagogy instead of teaching to the tools. We eventually get around to that, but first we spent a lot of time theorizing about the uses of Digital Pedagogy. 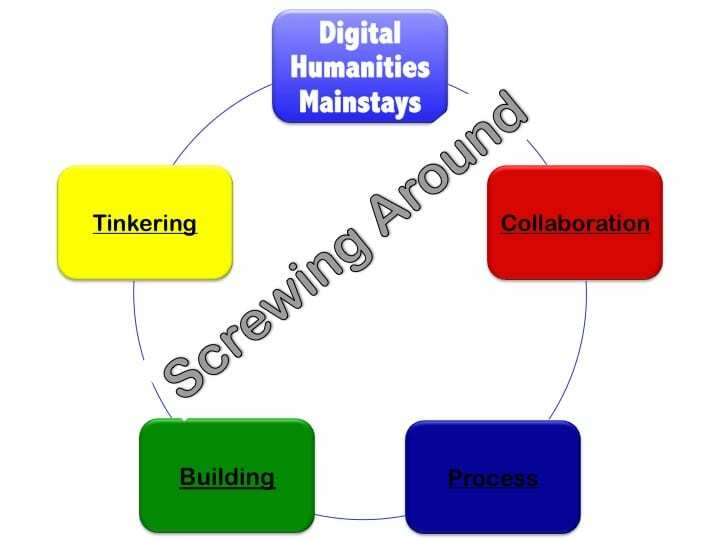 Much of the definitions on these slides come from the in-progress draft Introduction for Digital Pedagogy in the Humanities (currently openly available in GitHub in its post-peer review and pre-user-friendly digital platform phase). The project is scheduled to be finalized with a brand new digital platform that will allow for users to save pedagogical artifacts and keywords to a private account along with being able to search and utilize tags (e.g., beginner, intermediate, advanced levels of Digital Pedagogy; assignments; syllabi, etc.). The final platform, being built by our publisher, the Modern Language Association, is due to be finalized along with the entire project and the editors’ introduction during Summer 2019. With 4 editors, 84 curators, ~700 artifact creators, the project provides a wide array of pedagogical materials for use in many disciplines, even those outside of the Humanities. Digital Pedagogy Workshop from eCampus on Vimeo. The slides are available on Google Presention. The Lunch n’Learn gatherings are a terrific way to 1) meet faculty from across campus; and 2) enjoy a delicious lunch provided by eCampus. For other videos of lectures and engaging articles, check out the eCampus Resources page. I’ve spent a lot of my career here at SJSU converting my research-oriented practices towards a more forward-facing collaboration with my students in project-centered learning environments. During my first forays into adventures with SJSU English and Composition students more than a decade ago, I taught the way that faculty had taught me at Cal State L.A. so many years ago: lectures with lots of interesting discussion centered around a novel or poem or philosophical musing. Grad school was like that, too, until I got into my dissertation area. And, I just assumed, even while teaching at multiple schools in the City University of New York system, that all students were as fascinated as I was about literature, culture, news, politics, the world. The CUNY students at Hostos Community College, Queens College, and Lehman College taught me differently, but in the throes of finishing a dissertation, living in the vibrancy of NYC, and moving across country for a job, I didn’t quite get it. And, I didn’t quite get it when I arrived at SJSU an Assistant Professor in 2005, though I had just finished a traditional dissertation PLUS a project-based dissertation where my advisors let me roam around, ask questions, fail, and discover for myself. I hadn’t yet found a bridge to be able to facilitate that kind of learning…at least until Digital Humanities methodologies became much more transparent.